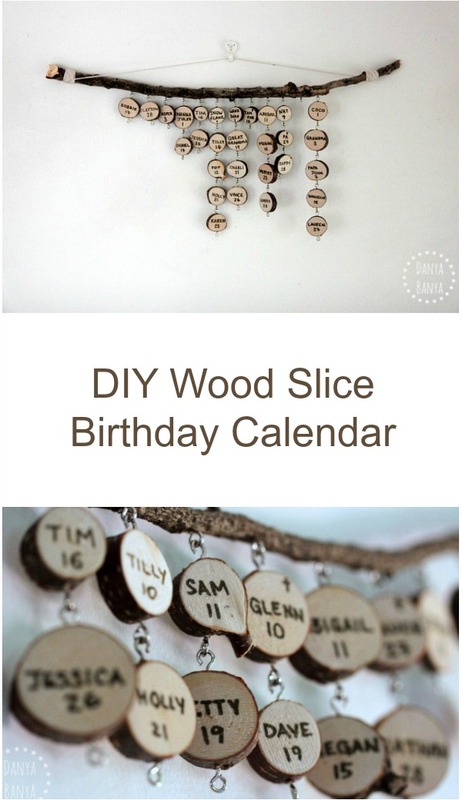 I made these lovely wood slice calendar mobiles as Christmas gifts one year. 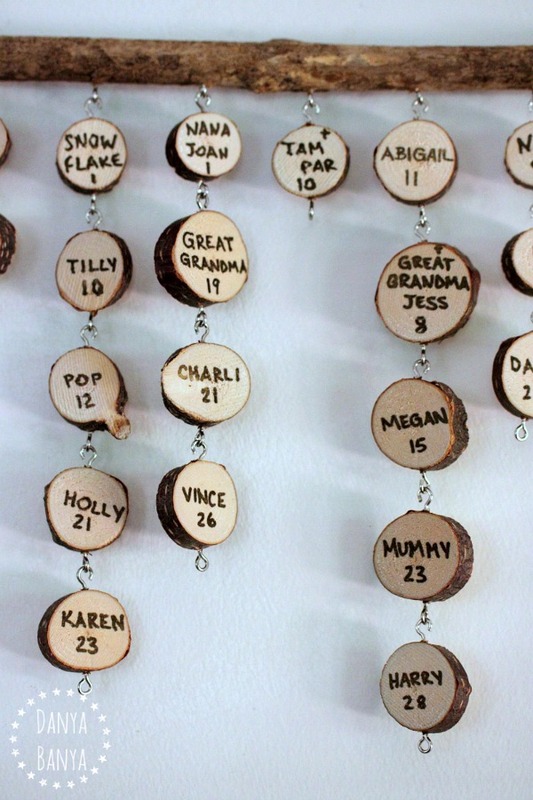 I made three – one for our home, and two sets for grandparents. I love how they turned out! So rustic and natural, and yet so personal at the same time. I know they’ll be treasured for years to come. This craft looks simple enough, but there are actually a few tricks. Before starting, I widened the gap in the eyelet of half of the metal eye pins, by sliding a butter knife into the small gap and levering it open, so that they looked more like hooks than hoops. 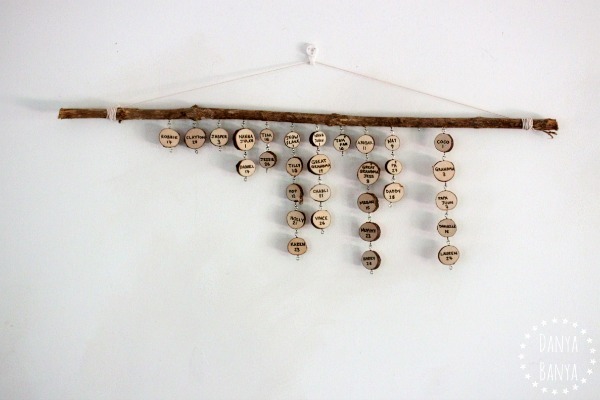 I screwed in two metal eye pins to each of the wood slices – the ‘hook’ ones on top and the ‘hoop’ ones on the bottom. 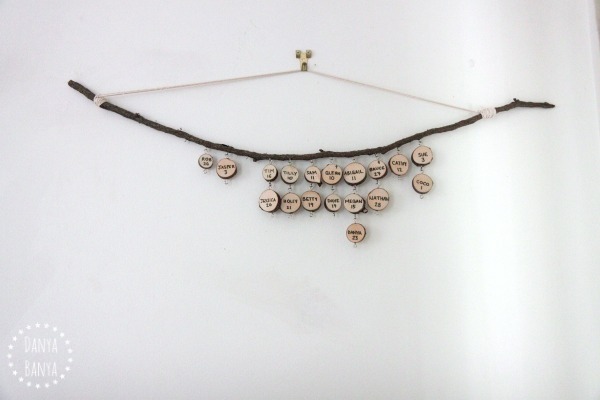 I also screwed in 12 hoop eye pins, evenly spaced, along a long rustic stick or branch. Then I wrote family and friends (and pets!) names and their birthday day on each slice. Gold marker look more dark brown than gold on the wood slice, and it looks much better than black. 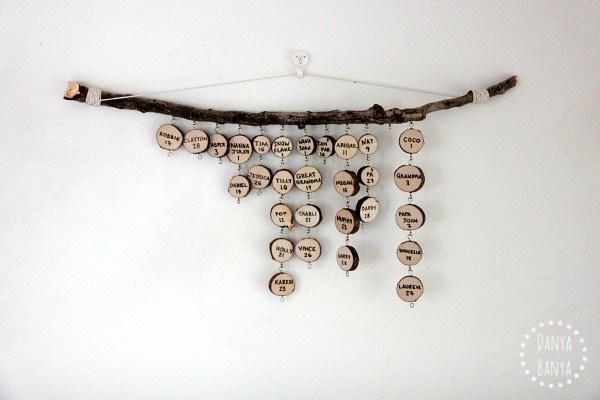 I tied some kitchen twine to each end of the branch, creating an easy way to hang it on the wall. 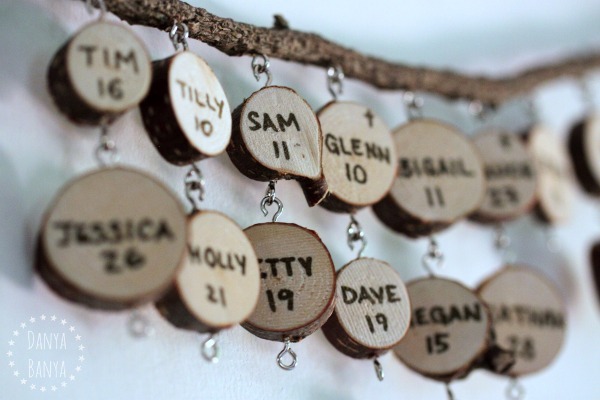 If you’re giving this as a gift, it’s a good idea to have extra wood slices (with the hook and hoop screws pre-screwed in) and the gold Sharpie on hand, because you can be sure the person receiving it will have extra friends and family that they want to add, even if you’ve tried really hard to remember everyone! 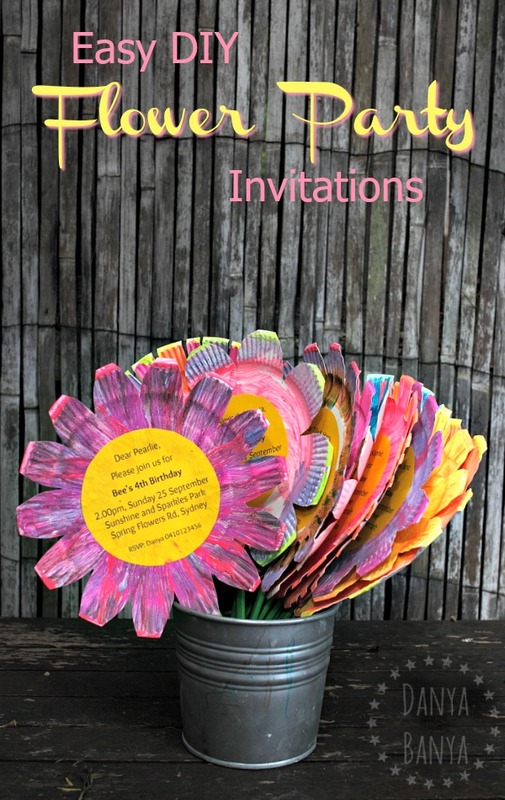 Easy 3D flower birthday party invitations, that kids can help make! Perfect for a spring flowers theme. 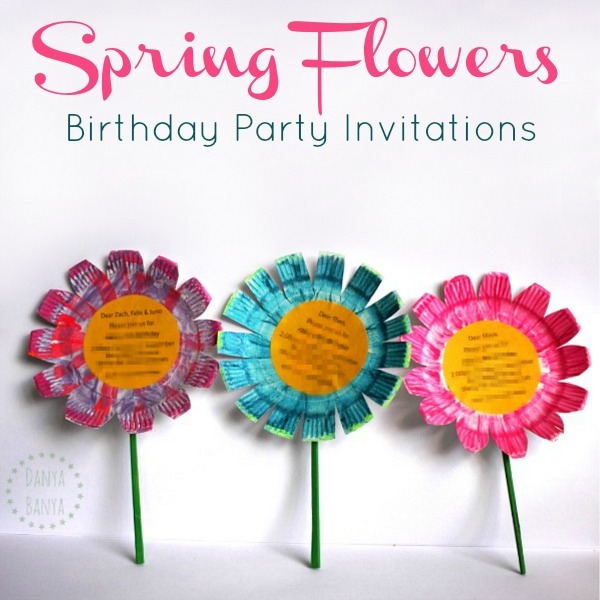 Bee had a ‘spring flowers’ birthday party theme for her fourth birthday, so we made these cute flower birthday party invitations for her to give out to her friends. Aren’t they just adorable! And they were the easiest ever to make. Let me show you how. * Contains affiliate links to similar products. Everyday craft items like paint brushes, scissors, glue stick, computer, printer, etc. 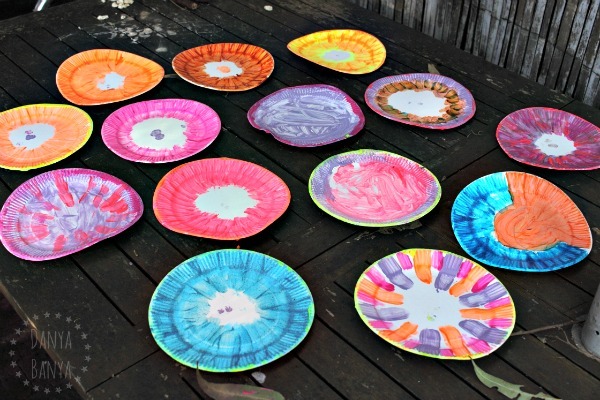 Step 1: Paint your paper plates! 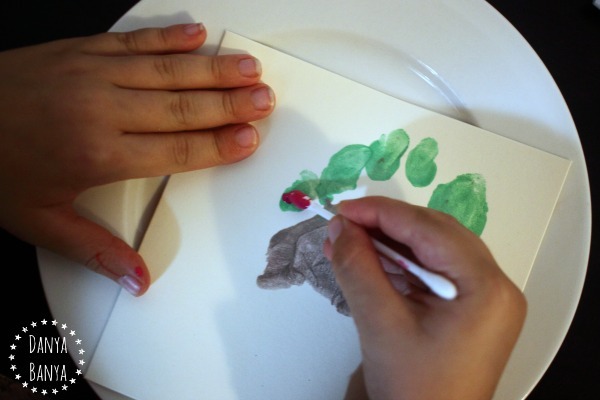 The first step is the most fun – paint paper plates! Bee and I painted alongside each other, as we like to do. 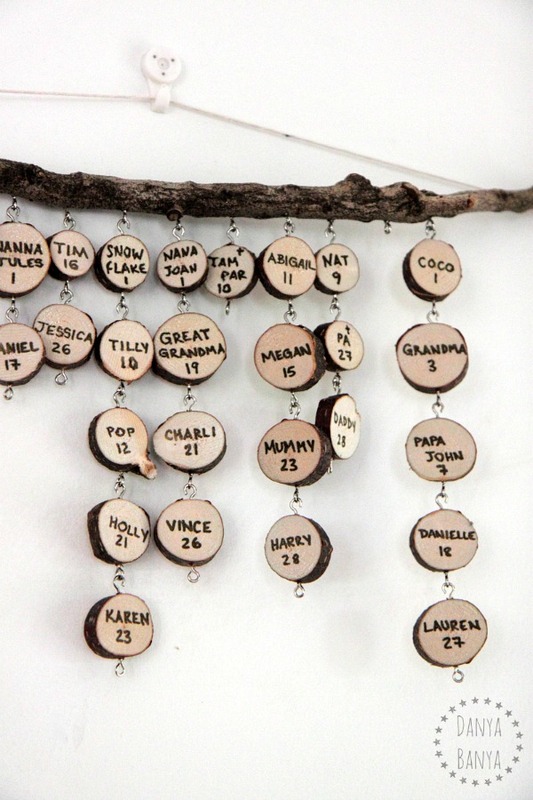 The beauty of this craft is that you can paint your plates any way you like! (But bear in mind that the middle bit will end up being covered.) We used a few different types of paint (whatever we had in our craft cupboard), but these neon paints ended up looking the brightest when dry. We tried to leave as little white space around the outside as possible, and experimented with a few different coloured borders and patterns. While you’re painting, you might like to separate your chopsticks and paint them green for later on. Acrylic paint works best for wood. The next step is to hop onto your computer and design your invitations, so that all the details fit into a small circle shape. 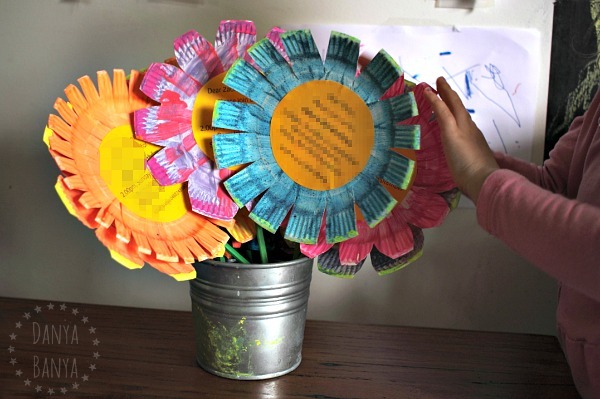 Then print them onto yellow paper, cut out and glue on the middle of your flowers. Go to picmonkey.com, and click ‘design’ to open up a blank white canvas. Go to ‘overlays’ (the butterfly icon on the left), then ‘geometric’, and add a black circle. Stretch it to almost fill your white square. Add a second black circle, change the colour to white, and stretch it so that it is almost as big as your first one. Add it on top, so that it looks like you have a large circle outline. In the ‘layers’ box, click the two squares with the down arrow to ‘flatten image’. Go to ‘text’ (the Tt icon on the left). Choose your font, and click ‘add text’. Stretch the text box to the width of your circle. 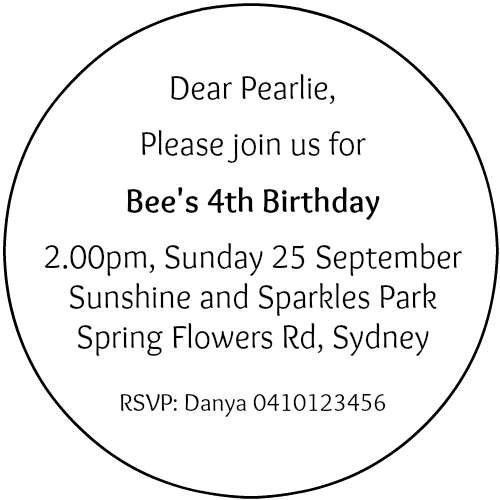 Type in your invitation details, centre the text, and play around with the size and spacing until it looks good. Click ‘add to hub’ to save an editable version of your invitation. You will also want to save a version on your computer for each person you’re inviting (or you can just save one version and hand-write the names on later). Open a word document, and paste a couple of invitations. Do a trial print to check that the circle and text are the right size and readable. I think we ended up doing two invitations per page. 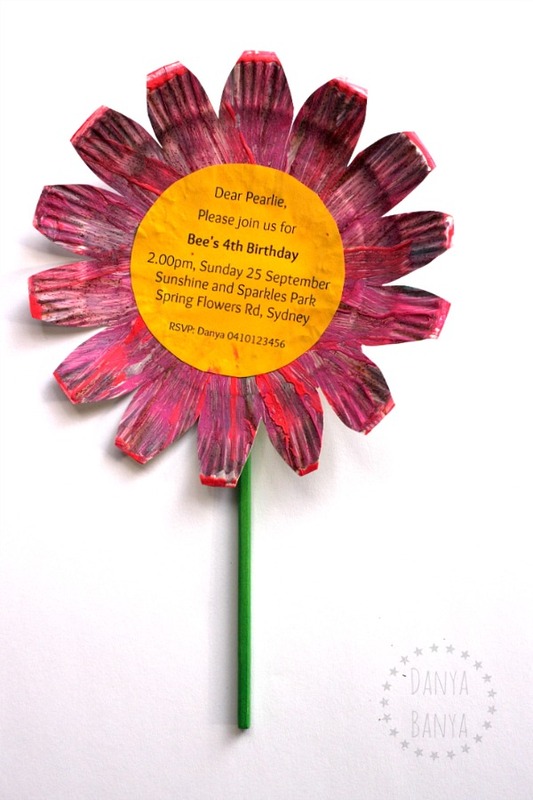 Once you’ve got your sizing right, paste each person’s invitation into a word document, and print onto yellow paper. Here’s our invitations mock up, just to give you an idea of the spacing. 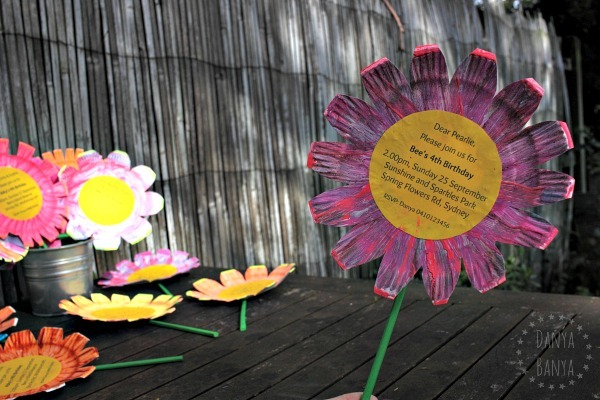 Step 4: Paste your invitations onto your paper plates, and cut into flower shapes. 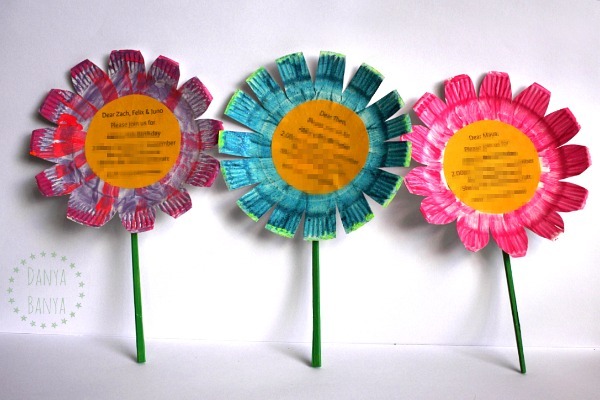 Cut out the invitations, and stick onto the middle of your painted paper plates with glue stick. (Double check that you can’t see any paint through the paper – if you can, you might need to add a second layer of yellow paper underneath). Bee was so proud of how they turned out! And she especially liked handing them out to her friends! 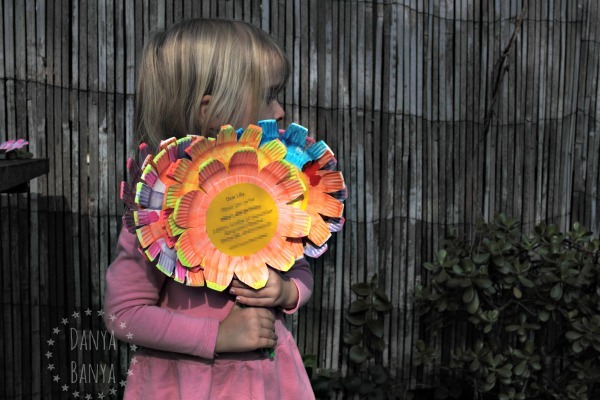 And I’ve collected lots of more flower themed ideas on my Flowers! Pinterest board. Plus, you might also like to subscribe and receive our latest posts via email. We’d love to have you join us! * This post contains affiliate link(s) to similar products used. An affiliate link means I may earn advertising / referral fees if you make a purchase through my link, without any extra cost to you. It helps to keep this little blog afloat. Thanks for your support. 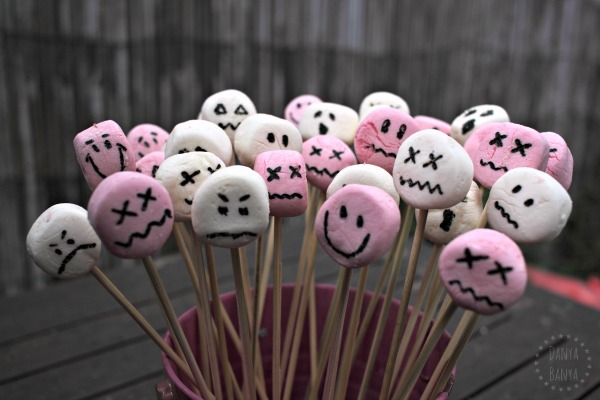 Spooky marshmallow treats on a stick! 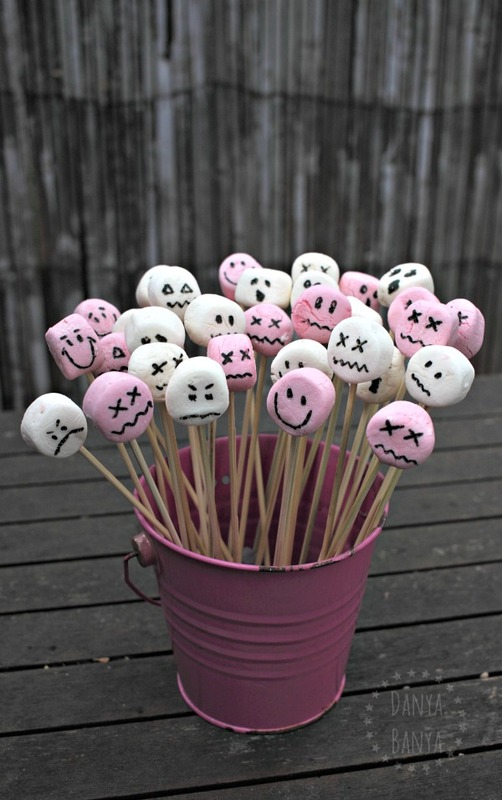 Fun (and easy) Halloween themed party food for kids. 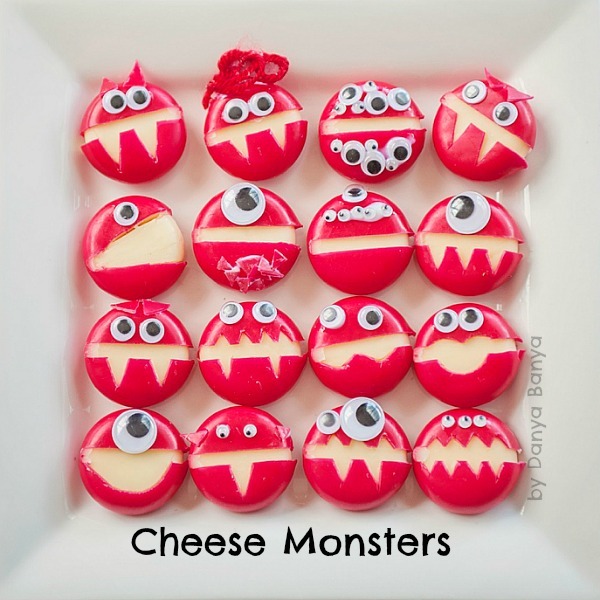 We made these cute little Cheese Monsters for my nephew’s 5th birthday party. Healthy party food ftw! This is a sponsored post for Nuffnang and illoom balloons. I just heard about this really cool new product: glow-in-the-dark balloons! Seriously! They are called illoom balloons, and they have an actual little inbuilt LED light inside each balloon, that lights up for up to 15 hours. 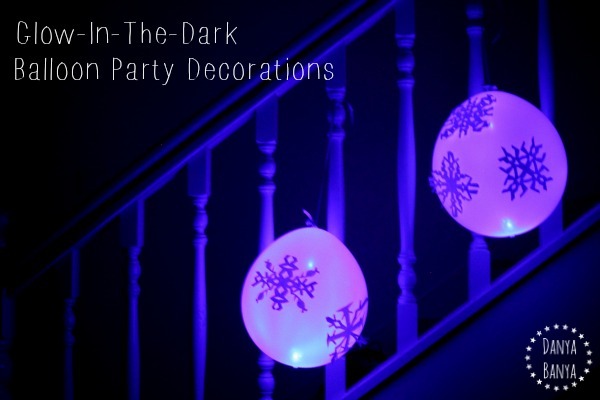 Illoom balloons would be perfect for a night-time party or a dark indoor disco, where you can hang up them and add a bit of light and festivity to otherwise dark corners. The darker the room (or night), the better and brighter they appear. 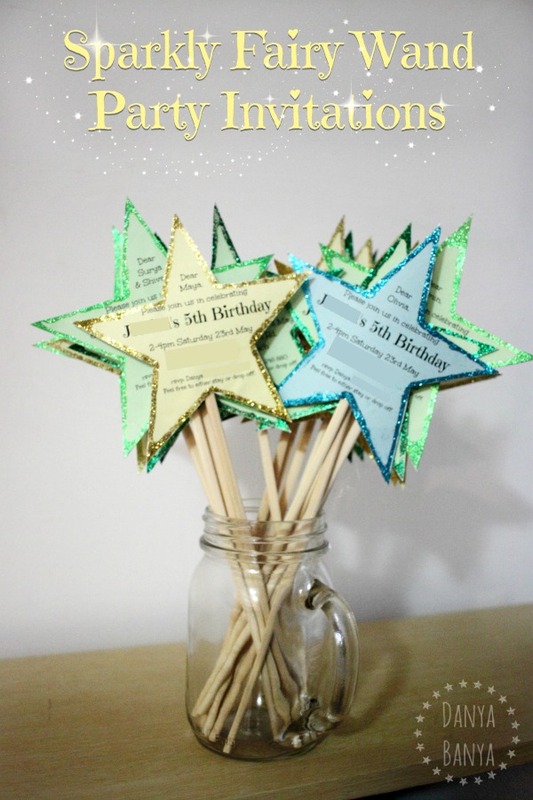 How to make DIY sparkly fairy wand invitations – perfect for a fairy themed birthday party. We had a fairy-themed birthday party for my daughter JJ’s 5th birthday. 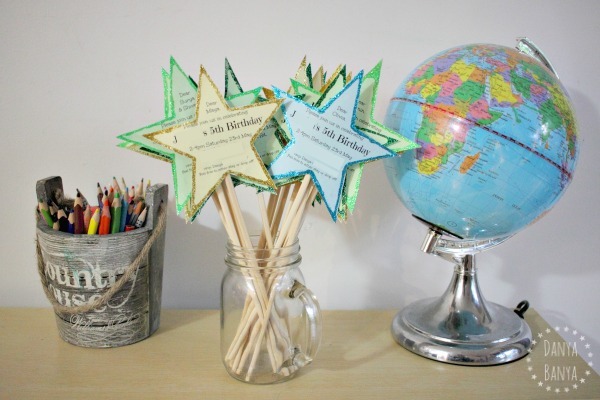 JJ and I made these DIY wand invitations, and she had so much fun handing them out! 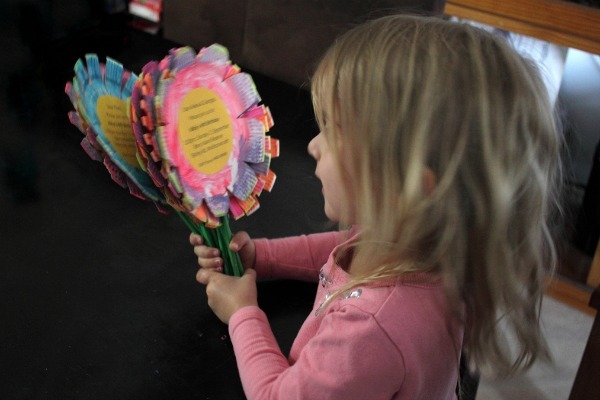 I’m still getting lots of comments about them several months later, and some of her friends even still use their wand invitations for fairy role-playing at home, so I thought I should share how we made them. 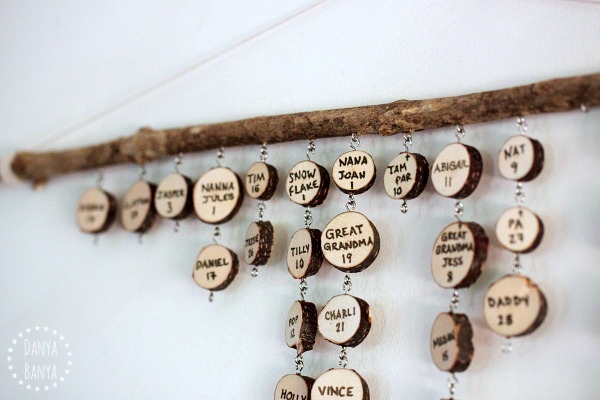 It’s a bit tricky sharing DIY invitations though, because they have our personal details written all over them! If I had thought ahead, I would have made up a mock version with fake details, but in the pre-party planning madness, I was too busy just trying to get all the things done so I’ve just blocked out all the personal bits from the photos. Sorry that this makes them look at bit sketchy! 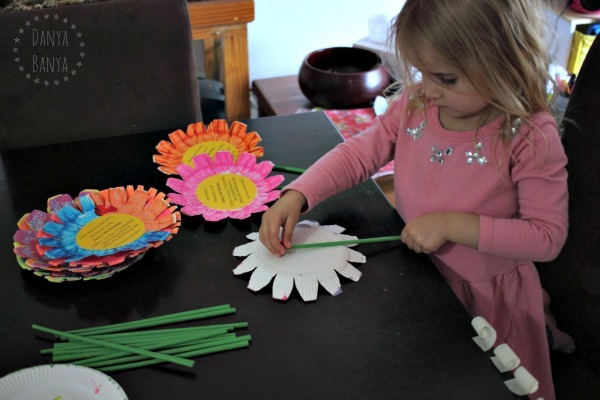 Simple fairy craft idea: pipe cleaner and wooden clothespin fairies! Cute home-made fairy dolls or fairy-themed party favours that are quick and easy to make. JJ turned five this week. FIVE! Such a big girl age! 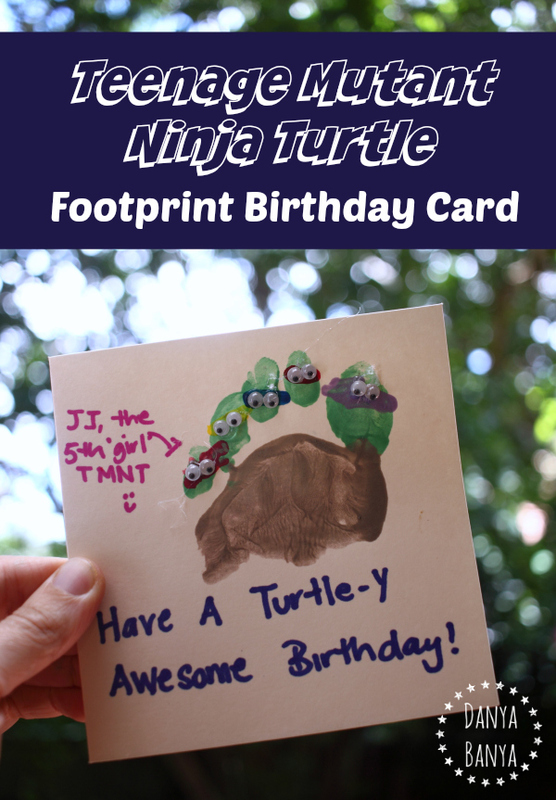 Make a (quick) homemade kids’ footprint Teenage Mutant Ninja Turtle birthday card. 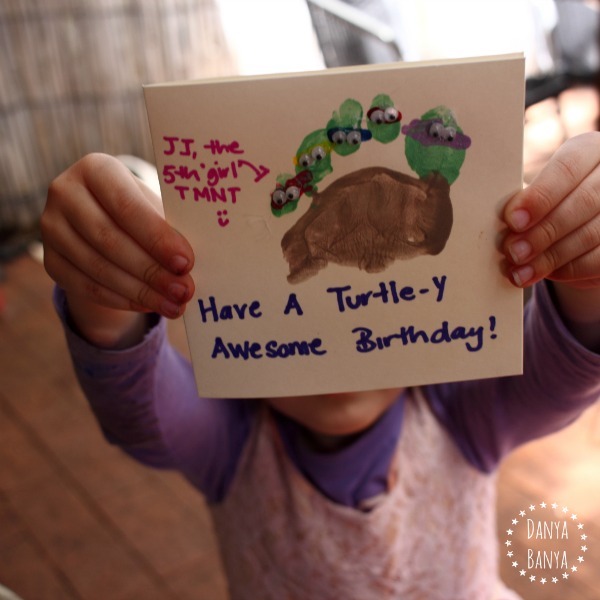 Then, about an hour before the party was supposed to start, she declared that she wanted to make the birthday boy a homemade card, it had to feature her footprint, and it had to be TMNT themed. Argh, talk about pressure! So I quickly googled, and was shocked that I couldn’t find anything – so we improvised. Quickly. Step 1: Paint on foot. Check. Step 3: JJ painted the coloured masks with cotton buds. We discussed the fifth toe situation, and she decided she could step up and be the extra TMNT with a pink mask (because purple had already been taken by Donatello). Pop back in the microwave for another minute to dry. Step 4: Because we were pressed for time, I stuck on the googly eyes using a low temperature glue gun. If we had more time, I would have used a regular clear drying glue so that JJ could do this part as well. 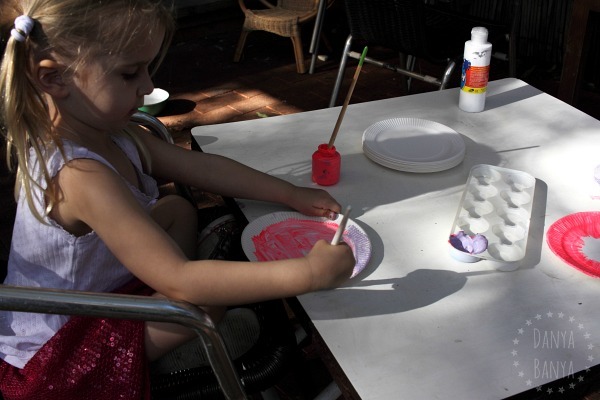 (Tiny googly eyes are really fiddly, so they would be great fine motor practise). 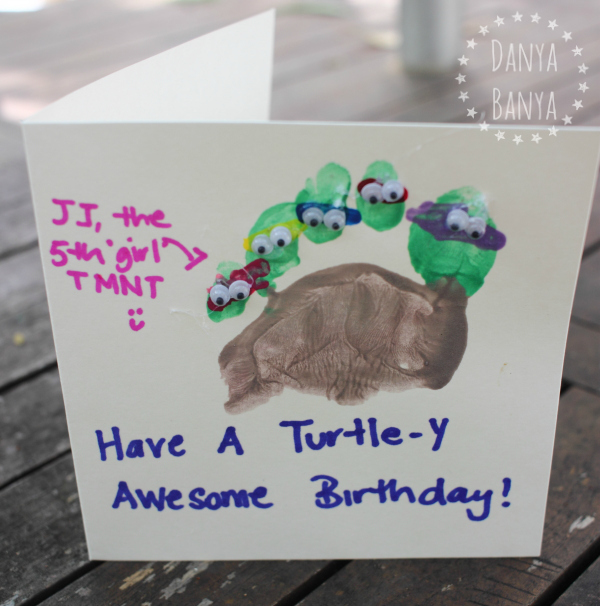 Step 5: Write a turtle-y awesome birthday message! Haha, I borrowed this particular pun from the front of the birthday invitation. JJ (at four and a half) is still learning to write, so I wrote on the front of the card and she wrote her name on the inside. Step 6: Pop it in an envelope, and go enjoy the party!!! She must have had a great time, because afterwards she asked if she could have a Unicorn Ninja party for her fifth birthday, which sounds like an absolutely amazing birthday theme (but one that I’m not sure I could quite pull off). So far she wants a Unicorn Ninja party, a Hippo Has A Hat party, an Alice in Wonderland party, an Under The Sea / Mermaid party… I suggested an Alphabet party, but I don’t think she’s buying it. I hope she can decide on something soon, because I need to start planning!